How does Jane Austen create negative feelings towards the character of Mr. Darcy in the first six chapters of the novel 'Pride and Prejudice'? How does Jane Austen create negative feelings towards the character of Mr. Darcy in the first six chapters of the novel 'Pride and Prejudice'? Jane Austen wrote Pride and Prejudice in the early eighteenth century. The didactic purpose of this wonderful piece of literature is to ridicule society's contemporary beliefs and practices, showing that it can be dangerous to hold too much pride and too many prejudices. Austen gets her moral and philosophical message across by using a range of narrative techniques; which some are obvious, for example the omniscient narrator and dialogue are quite easy to acknowledge; while the centre of consciousness of Elizabeth Bennet is much subtler and therefore harder to distinguish. The use of these narrative techniques causes the audience to create views and opinions on different characters, for example because the audience finds Mrs. Bennet annoying, subconsciously they find her views annoying, thus ridiculing society and adhering to Austen's didactic purpose; this is how Austen creates negative feelings towards Mr. Darcy. By using narrative techniques and the audience's views; that they have almost been forced to create, Austen leads the audience to feel certain things towards him. ...read more. Mr. Darcy's character is seen as rude and also he is 'continually giving offence', making the negative feelings towards him become even stronger; while Mr. Bingley's character has more of an 'easiness' and 'he never appeared dissatisfied'. This also creates the reader to see the true contrast between Mr. Darcy and other characters, which forces the feelings towards him into even further depression. Austen's purpose in grouping the characters as she has is to highlight further differences between the different views held by society. It is when she introduces contradicting characters that Austen tries to propel her moral and philosophical message, ridiculing the belief of one opinion by that of another. Austen uses a great deal of dialogue. This creates a conversational tone and involves the reader by giving the effect that the characters are directly speaking to them. The omniscient narrator, along with dialogue, is one of the most distinguishable narrative techniques used by Austen. The omniscient narrator is all seeing and all knowing and it is often commonly used, by Austen, to emphasis a point a character has made. When this occurs the readers can see that this is important information that they should acknowledge. ...read more. Also it shows that prejudices are just irrational feelings that are usually based on insufficient knowledge or information, that create people to judge others. As a result of reading Pride and Prejudice I have had to ask myself a lot of questions towards my attitude of the themes shown in the novel. These questions include:- * Are pride and prejudices dangerous to those that they are held by and to those they are against? * Should marriage be a result of true love or should it only be undertaken for those that seek financial security? * Does true love exist? To me Austen's approach has been subtle and indirect, making the reader have to think intensely about their feelings towards certain characters; especially towards Mr. Darcy, who there can be a great deal of feelings towards which are mainly negative. I think Austen's message will apply across generations as it evokes readers of all ages to create opinions on characters, and therefore placing there own prejudices on certain characters. Also, no matter how slight, the reader ridicules the society at the time, adhering to Austen's didactic purpose. ?? ?? ?? ?? 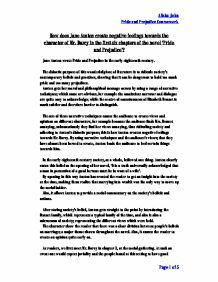 Alisha John Pride and Prejudice Coursework Page 1 of 5 ...read more. Explore Jane Austen's presentation Of Mr Darcy in &amp;quot;Pride And Prejudice&amp;quot;. Therefore, Darcy does everything in his power do help find Lydia. He now realises that in order to be able to accept Elizabeth, he must take on Wickham as a brother-in-law, having seen that everything wild about Elizabeth's family is seen in the na�ve Jane herself. Jane Austen strongly conveys to the reader that the lesson of the novel is pride has to be overcome in order for successful love. Jane Austen cleverly shows that once pride is conquered a character becomes much more favourable. Jane Austen has Darcy in the book to teach us this; Darcy portrays the pride in the title. a yoghurt gobbling businesswoman and John Beaver 'the cub' signifying a young, uncivilised beast. All of these metaphors help us to imagine what London was like at this time, a cold, uncongenial city where once you were no longer the subject of gossip, survival was a dangerous struggle. They are instead portrayed in more grayish shades. The classic example, of course, is Elizabeth and Darcy's infamous pride and prejudice, despite their being the supposedly ideal couple. The scene is far more realistic than the typical Gothic romances of the time; it shows a snapshot of everyday life, with human characters who have faults as well. This Book is based upon the life of Harper Lee. Her life is very similar to Scouts. Harper Lee's father was a lawyer just like Scouts father. However, the main thing that Harper Lee wrote about that reflects Scouts life was a court case that actually did take place called the Scottsboro trial, when she was six years old. He is prejudiced against Elizabeth as he judges her according to her mother and sisters, whom he sees as ignorant. Mr Darcy's pride not only causes Elizabeth to misjudge him, but many of the townspeople to become prejudiced against him.